We help individuals and organisations share and support each other through a programme of network activity. This includes an annual national conference, regional networks and events, online advice and guidance, and provide mentoring support. We’re working to map the nation’s sporting collections to better understand a) what collections exist and where they are held; b) how easily sporting heritage collections can be accessed and how we can better support access; and c) to what extent sporting heritage is at-risk and in need of support for collections care, rehoming, and rescue. To add a collection visit this page. 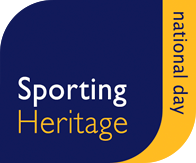 Held on the 30th September every year, the day provides a focus point for sporting heritage in the UK. It aims to raise awareness of the relevance of sporting heritage, encourage new and different audiences to have access to these collections, and encourage heritage and sporting organisations to recognise sporting heritage as an ongoing, significant element of their work, not just something of importance during major sporting events. We’ve seen a range of activity delivered including touring exhibitions which focus on local sporting heroes, schools programmes which develop activity linked to the national curriculum, town centre displays which show the link between sports participation and sporting heritage, and handling sessions held in national museums. For the first time this year, we have funding to support a community grants programme, supported by Art Fund. Working in partnership with the National Football Museum, Manchester and a number of Higher Education Institutions across the UK, we are funded by the Arts and Humanities Research Council to manage a consortia of research programmes which investigate sporting heritage collections in the UK. You can find out more about our programme of PhDs here, and about the over-arching museum collaborative doctoral programme. Also please visit our research section. We deliver discreet support for organisations and individuals who manage sporting heritage collections, or who wish to work with these collections. Our activity included providing simple telephone support and guidance, fund-raising and bid writing, evaluation, audience development and learning programming, project management, scoping collections and developing strategic plans. Recent clients include The Hockey Museum, The National Paralympic Heritage Trust, The National Football Museum, The Army Museums Network and Rambert Dance Archive. Over the coming years, we’ll be working with a number of key partners to deliver themed sporting heritage projects. Beginning with Sport and the Army in 2018 in partnership with AMOT, these projects will allow us to develop a greater depth of knowledge of sporting heritage collections in the UK, their relevance to different audiences, and work to establish an underpinning infrastructure which supports all sporting heritage collections.